15-August, 2016 (Monday). The IPM Climate & Weather Conference. Albany County Cornell Cooperative Extension, 24 Martin Rd., Voorheesville, NY 12186. Pre-registration (closes August 10) is required. For more information and to register, see The Climate and Weather Conference website. Speaking of which, growers in Western Massachusetts who farm in Franklin, Hampshire, or Hampden Counties, and who lost their peach crop to the February cold, are eligible to apply for CISA's Emergency Farm Fund. Restrictions apply, but for more information, see the CISA Emergency Farm Fund page. I guess apple maggot and codling moth are the only real insects of importance at this time. (Although a recent influx of potato leafhopper is giving me some grief on top-worked grafted trees that are still actively growing. Carbaryl to the rescue.) Apple maggot should be at it's peak hatch, especially with this rain, and earlier ripening/soft-fleshed apple varieties are most subject to damage. Imidan would be the gold-standard treatment for apple maggot (Assail if you want to be eco-friendly), while Delegate, Altacor, Assail, or Belt would be good reduced-risk choices for codling moth (if you have a problem with them). Azalea caterpillars (Datana sp.) seem to be in a bit of a frenzy this year, although not really a problem, as they cause severe but very isolated defoliation. They have been observed on blueberry and apple among others. Nasty-looking little things. 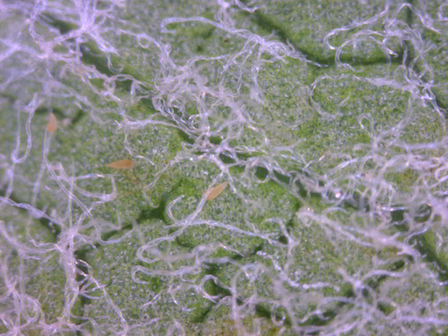 Apple rust mite damage observed on some young trees. I have been puzzled in the past by this kind of leaf-curling/discoloration, wondering if it was mildew (Cooley says no). Note the curling and brown patches. I finally looked under a scope and indeed confirmed a heavy infestation of rust mites at 200 power. (They are tiny!) Consensus seems to not worry about it too much as they are food for mite predators, but, they kind of bother me a bit, can't make things any better for drought-stressed trees. Not all over the place, although I have seen it in Honeycrsip in the past. 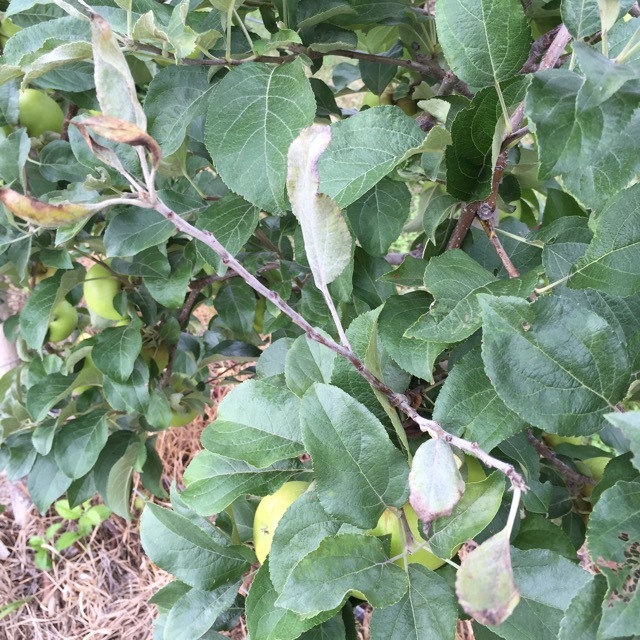 Warming temperatures and climate extremes change apple disease. In the long run, over the last 20 or 30 years, we’ve seen diseases that seldom infected apples in New England become increasing problems. Count powdery mildew as one of these. 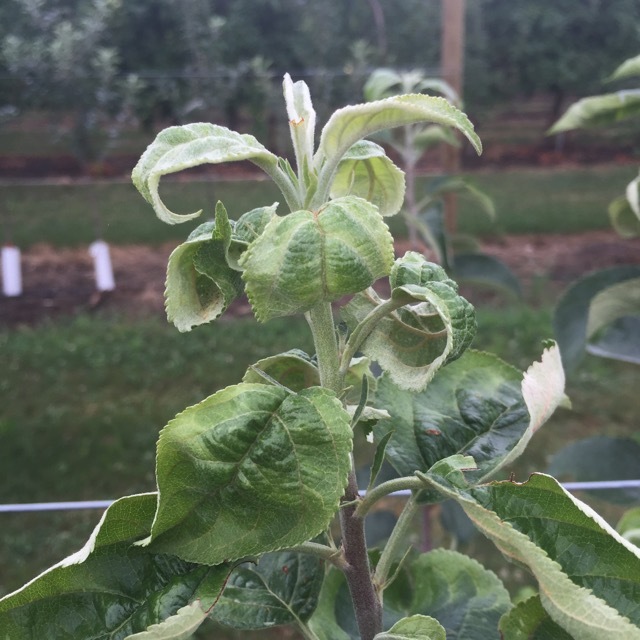 Powdery mildew on apples isn’t really a major issue in the region, but it increasingly shows up here and there. More often than not, we focus on scab and fire blight during early spring through petal fall, since these diseases alone can cause plenty of headaches. Choosing a scab fungicide has enough problems that we don’t bother to figure mildew control into the selection. As long as powdery mildew doesn’t cause real damage, that’s okay, but those days may be coming to an end. Powdery mildew likes warm, humid, but not wet, weather. The fungus grows well during long periods without any rain. Where have you seen that lately? Let me quickly add that it’s too late to use fungicides against mildew this year. Terminal buds have set so there’ll be no new PM infections. Control for next year starts with pruning out infected material. 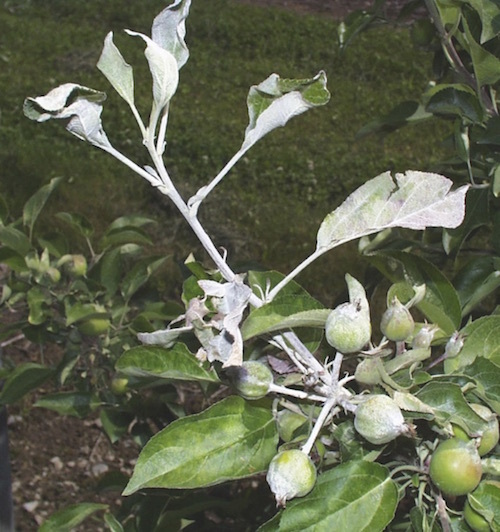 At this time of year, infected apple leaves are curled with white to gray to brownish areas. After leaf fall, one-year old shoots may have white powdery mildew colonies. If you see mildew, prune it out. Most of the inoculum for next year will come from infected buds which don’t look all that different from healthy buds until they start to grow. Then the fungus infects new leaves and shoots, visible around tight cluster as white, and yes, powdery blemishes. Much of this powder is actually made up of spores which can get blown to healthy leaves, where they cause more infections. These will start to show up around petal fall. Until bud set, the fungus causes new infections, including bud infections that will be inoculum the following season. Cold temperatures during winter will kill mildew infected buds, eliminating the fungus. Temperatures below 10ºF will kill infected buds; at -10ºF 95% of infected buds are killed. The key to powdery control is to use an effective fungicide starting at tight cluster and going through to bud set, at least on sensitive cultivars. See above comments on harvest maturity and upcoming ReTain applications. 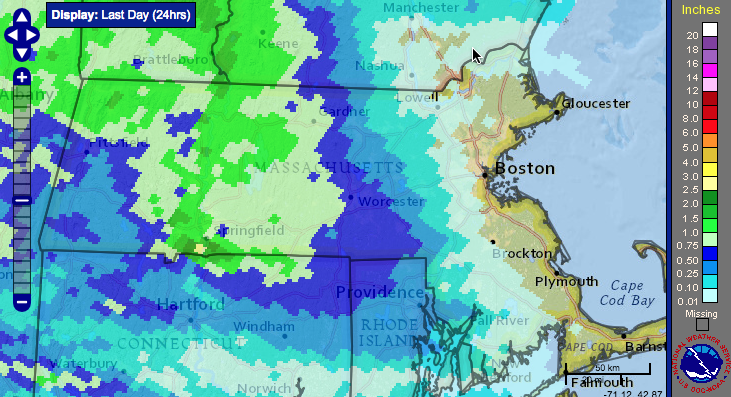 (We'll probably have something out on ReTain use in the next week or two. No need to apply really anytime before August 7 at the earliest. Stay tuned.) Could be doing a little summer pruning on apple to open up canopy (disease control and fruit coloring). Prepare for harvest. Reprinted from Scaffolds Fruit Journal, Volume 25, No. 20. August 1, 2016. 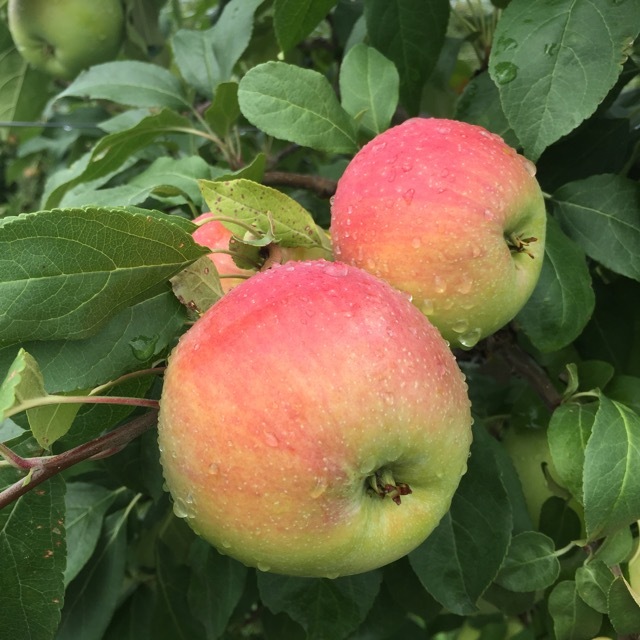 Before and during apple harvest in recent years, a number of growers and fieldmen are sometimes unpleasantly surprised by the appearance of neat little (2 mm) holes bored into the side of their fruit, similar in appearance to those caused by a stem puncture. Although graders sometimes attribute this damage to apple maggot or European corn borer, cutting open these apples reveals a bright green worm with a light brown head, 3 pairs of true legs and 7 pairs of prolegs, not feeding but lying inactive, in the burrow extending in from each hole. 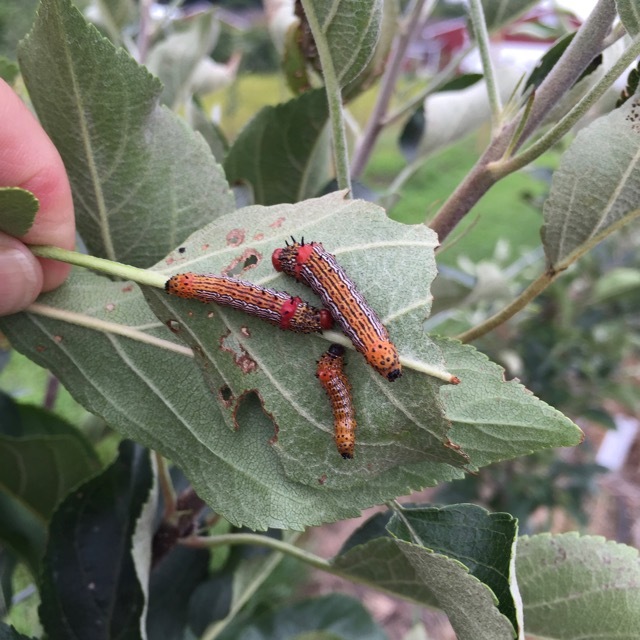 These are larvae of the dock sawfly, Ametastegia glabrata, a highly sporadic but nonetheless well documented apple pest that has been known to show up in our area since 1908. Dock sawfly probably confines its feeding almost entirely to plants belonging to the buckwheat family (Polygonaceae), including numerous docks and sorrels, the knotweeds and bindweeds, or else wild buckwheat or alfalfa. In feeding on any of these plants, the larvae devour the leaf tissue and the smaller veins, eating out irregular holes in the leaves. Ordinarily, the midribs and the larger veins are untouched. This insect should not be confused with the related European apple sawfly, Hoplocampa testudinea, which has a whitish larva that lives and feeds in young apples, particularly prevalent in the eastern apple regions of N.Y. Injury to apples by the dock sawfly is known tooccur generally in the late summer and early fall, when the fruit is approaching maturity and the sawfly is searching for an overwintering site. The greater hardness of immature apples probably deters the larvae from burrowing into these, so although 4 generations per year have been identified, only the last one or two are of concern to apple growers. 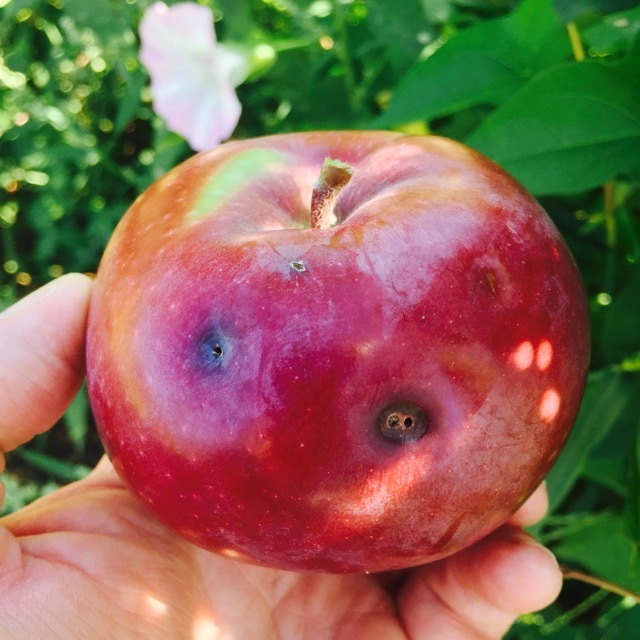 The injury to apples consists externally of the small round holes bored by the larvae, which after a few days show a slightly sunken, brownish ring around them and occasionally may be surrounded by a larger discolored halo. These holes may occur anywhere on the surface, but are most numerous around the calyx and stem ends, or at a point where the apple touches a leaf or another apple, since it is easier for the larva to obtain a foothold here. Inside, the injury is usually more serious, since the larva often burrows to the core and usually hollows out a pupal cell somewhat larger than itself. Apples may have three or four, or sometimes even eight, holes in them of varying depths, but contain only one or two worms. Since the dock sawfly does not feed upon any part of the apple tree, but must live on the above-mentioned succulent weeds, it becomes an apple pest only where these plants are growing in or around the orchard. There is little danger from this insect in orchards where the food plants don't exist. Likewise, the possibility of the larvae coming into the orchard from neighboring meadows, ditch banks, or roadsides is slight, for the larvae are incapable of finding their way over any extent of bare soil. The adults, though active, are not strong fliers, and it is not possible for the insect to travel far in this stage. Now would be a good time to assess the weed situation in your orchard and make plans for such selective herbicide applications as may be appropriate regarding this insect. Even though common wisdom says this sawfly is a pest only every 10–12 years, this is only an average estimation, and it's not a bad idea to anticipate the unexpected when hardly any season is considered to be "average". Sorry, no video this week. But watch the apple rust mite video above! 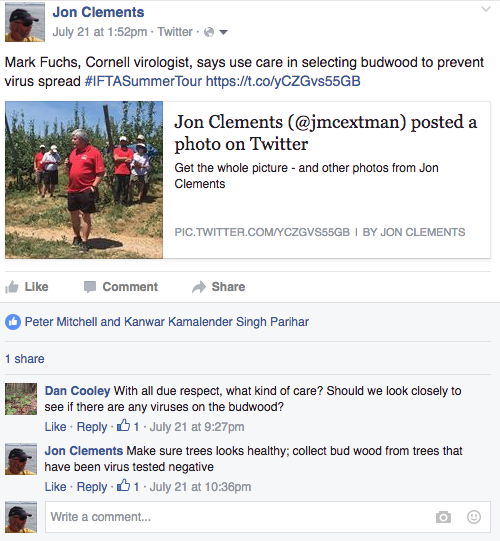 The next official Healthy Fruit will be published on Tuesday, August 16 (in two weeks, or thereabouts), 2016. As always feel free to get in touch with any member of the UMass Fruit Team (http://extension.umass.edu/fruitadvisor/team-members) if you have questions or comments.